Positive Anymore: "Dope, Drink and Tonic" or "The Other Cola Wars"
I was raised by and around linguists, and thus heard murmurings regarding the competing merits of the words "pop" and "soda" throughout my childhood. I never paid them much heed; in fact I suspected it was a fake disagreement, like the University of Chicago's annual Latke-Hamantash debate, or perhaps some epiphenomenon of the then-raging Cola Wars. I thought to myself, "What's the big deal? They're both perfectly neutral and interchangeable terms." Then I left the comforts of Chicago for college and was confronted by a dormitory full of Californians and Northeasterners who would howl with derision and displeasure any time I said "pop." Suddenly it occured to me that there was something to this matter. I asked around a little, discovered the (to me) surprising Southern use of "coke" as a generic term, as in "7-Up is my favorite kind of coke." Upon further reflection I realized that while "soda" struck me as a neutral term, one that I would never notice someone else using, I would never utter it myself. Ultimately I formed a more-or-less accurate mental map, with "coke" in the South, "soda" in the Northeast and California, and "pop" in the Midwest and Pacific Northwest. Beautiful, isn't it? I should mention that maps are a lifelong passion; give me an atlas and I can stay happy and entertained for hours. Why do I love this map so much? Mostly because the data is so clearly presented; you don't need any isoglosses artificially thrown in, especially in the East where population is dense and counties small. The quality and clarity of the data is all the more remarkable given the incredibly scientific sampling method: the data comes from a website that had a form for visitors to fill out. That's it. Such beauty from such humble origins. What this shows is that this is an entrenched lexical difference in American vernacular speech, and moreover one that involves frequently used words -- in classical American dialectology, the reliance upon obscure terms borders on the ridiculous: "What do you call an oblong barrel for fermenting barley in -- a jim-wheelie [That's the Midland term] or a huck-pot [the Southern one]?" Okay, I made that up. Anyways, whoever you are, wherever you're from, if you're American you use a word for sweet carbonated non-alcoholic beverages that reflects where you are from more than anything else. A few remarks about the map itself. 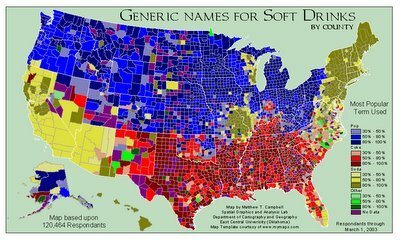 First off, the distribution of "coke" is an amazingly good indicator of southernness. Not only does it skip over the heart of Appalachia (West Virginia, Eastern Kentucky), but it includes the "Hoosier apex," that is, the part of southern Indiana that Hans Kurath considered a northerly outpost of Southern dialect. Furthermore, Maryland's Eastern Shore, the most culturally Southern part of the state is an isolated "coke" area. In contrast, the pop/soda isogloss does not fit neatly with any cultural isoglosses I know of. And as a pop-sayer myself, I look with pride on the grand stretch of blue from western New York all the way to Seattle. Notice also the sort of indeterminate area in North Carolina where "soda" and "coke" meet. This is due to two different local terms, "dope" and "drink." I think this proves what I suspect Walt Wolfram of believing, that North Carolina is the weirdest part of the country, dialectologically speaking. That the Boston area has a lower percentage of "soda" sayers is due to another localism, "tonic." I asked a Bostonian friend if he knew the term, and he said, "Sure. Gym teachers say it." I think that's an interesting sociological observation right there. For my part, I always associated a strong Chicago dialect with car-salesmen. Though now that I think about it, gym teachers weren't far behind. I always thought that Coach Z talked exactly like a coach should. Then I realized he was supposed to have a Chicago accent. Also noteworthy are the two "soda" islands in the Midwest, one in eastern Wisconsin and another in a large area roughly centered on St. Louis. I can only speculate about why they exist, but I can relate that people from these areas have told me that for them "soda" is a prestigious term that they associate with urbanites, while hicks say "pop." This makes sense, since the eastern Missouri/southwestern Illinois soda island radiates out from a major city (St. Louis), and eastern Wisconsin one divides the more urban, industrial eastern part of the state from the rural, agrarian west. Finally, I think I now understand why I failed to see any real distinction between "soda" and "pop." While I was from the heart of the "pop" zone, I was exposed to mass American culture, which is produced in the "soda" saying lands of California and the Northeast. Thus "soda" seemed so acceptable to me that I didn't even know I didn't say it. A footnote about Coach Z: although his Chicago dialect (or maybe just Inland Northern, though his dental fricatives do border on plosives) is not bad -- certainly not much worse than that of the Superfans -- the feature of his speech that gets the most attention is an exaggeration of a Midland one. Hello Ben, I found your blog by hitting the "random blog" button. Very interesting, I'm glad I found your Cola Wars post because I've actually thought a lot about it. I'm from Boston and I say soda and I laugh at people who say pop. Interesting, though, that my step family from Connecticut all say pop. Seemingly linked to the pop/soda debate is the sub/grinder battle. I call submarine sandwiches "subs," others say "grinders." One note though, having grown up in Boston, I have never once heard anyone refer to soda as "tonic." Not even my gym teacher. The sub/grinder thing is also an interesting phenomenon. I've been told that "grinder" is a New England thing. I've spent almost no time in New England, so I've never heard it. Here in New York they say "hero" and south of here in Philly they say "hoagie" - I remember on the Cosby show that Cliff Huxtable, who was, like Bill Cosby, from Philadelphia, always went out of his way to talk about hoagies, out of local pride I assume. I guess what makes the "soft drink" phenomenon distinct from the "oversized sandwich" phenomenon is that the occasion to speak of soda or pop arises more frequently than the occasion to use the word "sub" or any alternative. Also, the sandwich distinctions are all in the Northeast; everyone else says "sub" as far as I know, while the pop/soda/coke isoglosses run throughout the country. Never heard "tonic," eh? Another moribund localism. A bit of a shame. when i was in college in central illinois, i always fought with my friends from st. louis over pop vs. soda. weird that st. louis has the northern cities shift, but not pop. also weird that the entire state of ohio is blue, but there are some massive isoglosses that run right through the state! i think florida and oklahoma came out the prettiest. I realize this is an old blog. I hope you have a way of tracking new comments. I am from Virginia originally but now live in Indiana. These are very different states but have one interesting commonality--they both have the Southern/Northern cultural line running through them. I found your entry by searching "hoosier apex." Your Cola Wars map proved something I had observed but not found verified til today--that the heavy southern inflence in Indiana goes even further north of Indianapolis than I have heard others attest to. Good work getting that map out to cyberspace. On another note, having lived in both Northern Virginia (which is only about 3 counties out of 90 some in the state) and in Richmond, Va., I have never heard "dope" for cola. Perhaps it is a more rural phenomenon. However, I have heard from a number of Virginians some social rules around the word, "drink," which might interest you. As much of Virginia is still dry and local custom was/is set by largely Baptist and old-time Methodist influences, references to alcohol or even the possible suggestion of alcohol are avoided. So, the customary (polite) expressions have been "May I offer y'all something cool to drink?" or the even more cautious, "May I offer you something soft to drink?" To directly offer someone "a drink" implies something alcoholic and is reserved to family, close friends and the back porch. While "soft drinks" is the prefered local reference, this category also includes sweet iced tea, lemonade, limeade, lemon-tonic, and lime-tonic (which must be the origin of Sprite). By the way, a lime-tonic which is a wonderful "front-porch" "soft-drink," is made with fresh-squeezed lime juice over ice, a shot of 50/50 diluted cornsyrup and the rest of the glass filled with soda water. It is so southern a refreshment you'll start waving to the traffic going by. Fascinating stuff, Jason! The dope on "dope", as I understand it, is that it's particularly North Carolinian, which would probably explain its absence from Richmond and Northern Virginia. The sociolinguistics of "drink" are definitely interesting. I think I read somewhere that "drink" for "soft drink" is an Appalachian term, although if I remember right, eastern Kentucky is full of dry counties. I'll definitely have to try a lime-tonic this summer. Zelda Sayre liked her dope with spirits of ammonia Not the ammonium we buy by the gallon but more like bitters you could get in an old fashioned drug store. Based on the period of day, you can hide from sunlight under shade or receive an amazing tan. If you want to have a shower prior to your flight, you can create your path to the premium services and permit the agent know. Once again you can prevent this if you get a bottle that is always superior value. 1 drink could possibly be redeemed at any particular time. Customising these drinks that are unique to every event are guaranteed to impress new and present clients who will appreciate the premium quality ingredients that are employed in the creation of our own brand drinks with waw aspect. Moreover, some menu items can contain alcohol. Thanks for the article! Discover wide selection of thirst-quenching soft drinks online.